Not enough happens in Song One for the movie to really qualify as unpredictable, but it deserves credit for a steadfast avoidance of melodrama in a story that practically begs for it. 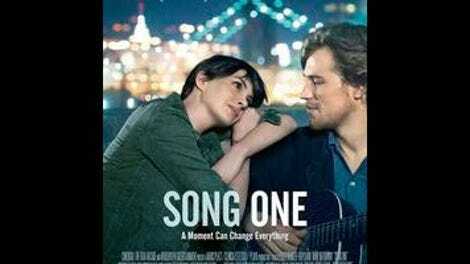 For example: The film opens with an accident that puts aspiring musician Henry (Ben Rosenfield) in a coma, bringing his semi-estranged sister Franny (Anne Hathaway) back to New York City from her Ph.D. work overseas. Almost immediately, the movie establishes Franny’s reunion with her mother (Mary Steenburgen) and unconscious brother as both sad and frustrating, replete with a lot of waiting around and hoping for the best. Restless from the routine of a hospital vigil, Franny obeys her anthropologist instincts and starts researching her college-dropout brother’s life. Working from the kind of impressionistic sketchbook/scrapbook/diary hybrid so often kept by sensitive young artists in movies, she visits places Henry likes, listens to songs he worked on, and attends a concert performed by his idol James Forester (Johnny Flynn). At the show, Forester is handsome, sensitive-sounding, and a little tentative; Franny, maybe desperate to make a connection with her absent brother, appears almost hypnotized by him. The movie is transfixed, too. Following an opening 15 minutes that uses quick handheld shots and sharp editing to deliver exposition efficiently (if not exactly thrillingly), writer-director Kate Barker-Froyland holds on the sight of Flynn strumming a guitar, then playing a viola, for longer than almost anything else in the movie. After the show, Franny introduces herself to James and tells him about Henry. The musician eventually joins her on her city rounds: at rock clubs, on rooftops, and at Henry’s bedside. The film’s patience, scale, and general tunefulness can be described on a John Carney scale: It’s somewhere between the intimacy of Once and the starry-eyed earnestness of Begin Again. It takes a more convincing New York tour than the latter, maybe because Hathaway and Flynn don’t dart all around the city for magically photogenic locations, instead concentrating on a smaller and more geographically convincing radius, mostly (but not limited to) the Williamsburg neighborhood of Brooklyn. Musically, the narrow scope is less rewarding. Song One only occasionally deviates from solo-acoustic performances, depicting Williamsburg as full of tasteful MOR folkies—a probably unintentional portrait of gentrification’s endgame. The new songs for the film were written by indie-rock couple Jenny Lewis and Johnathan Rice; they do an admirable job inhabiting a new musical character, but Lewis’ rueful humor and conversational storytelling is much missed. Even the real-life musicians who pop up for background flavor, like folk rock band the Felice Brothers, appear in less raucous, more stripped-down forms. (Forget about hip-hop or punk; the film’s Williamsburg barely even has any electric guitars or drum sets). There is nonetheless a sense of realism about this slice of the music world, like the way that James Forester, who hasn’t put out a record in five years, comes across as a slightly faded indie sensation busted back down to smaller venues—and how some of his cult following seems to be maintained by his good looks as much as his art. Moreover, as with the best moments of Carney’s films, Barker-Froyland doesn’t impose artificial romantic conflict on her material. Though the movie sometimes follows through on its early threat to become a series of shots of Hathaway staring at things emotionally, often it keeps the drama low-key and affecting. There’s a nice scene where Franny’s mother invites James over for dinner, and goads Franny into singing along with the America song she loved as a kid; the moment says more about her grief and uncertainty than drawn-out confrontations would. The less fortunate B-sides to the movie’s unforced melancholy are its slightness and its sincere belief in the healing power of pretty acoustic ballads. (Begin Again’s original title, Can A Song Save Your Life?, could also work here.) Ultimately, it’s hard to tell where the characters’ naïveté ends and the filmmaker’s begins. But Song One is at least succinct and savvy enough to cut to black before that question can linger.